hosted by our fabulous Mousey Teamie Snoopy. First, we'd like to thank you all so much for playing along on this challenge. 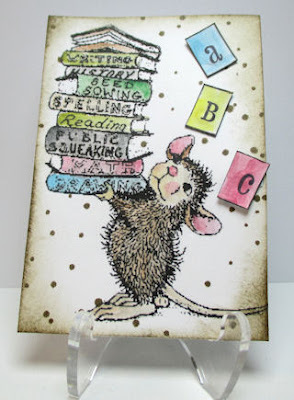 We have thoroughly enjoyed seeing your beautiful and creative Back to School and Anything Goes cards. and include the words "HMFMC Winner" on your email subject line. You might also like to grab this HMFMC button to use on your own Blog! Please join us again this week for our NEW CHALLENGE #HMFMC203: BINGO. Simply scroll down one post or CLICK HERE to join the fun. I just discovered I'm in the top three for the Back to School Challenge. Thank you, and congratulations to the winner, Vicky! 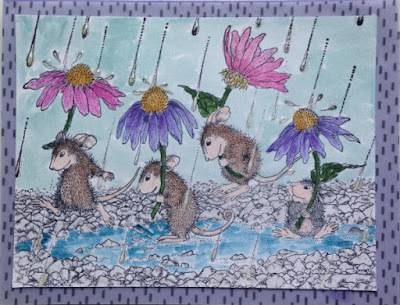 Thanks to the Design Team and all the entrants for the great House Mouse "Eye Candy." I've been trying to put the "Top 3" button on my blog, but when I click on it, I'm sent to the top of the page. Can someone help? Hi Mezzokat. Thanbk you for your message. Have you tried right clicking then copying and pasting the button, then adding a link with blogger? That seems to do the trick.